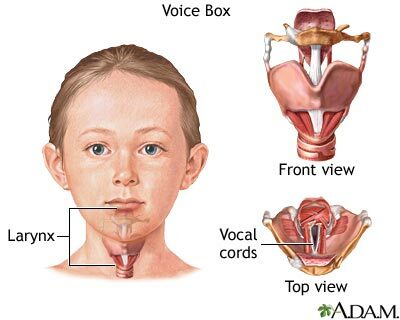 The larynx, or voice box, is located in the neck and performs several important functions in the body. The larynx is involved in swallowing, breathing, and voice production. Sound is produced when the air which passes through the vocal cords causes them to vibrate and create sound waves in the pharynx, nose and mouth. The pitch of sound is determined by the amount of tension on the vocal folds. Updated by: Linda J. Vorvick, MD, Medical Director, MEDEX Northwest Division of Physician Assistant Studies, University of Washington, School of Medicine. Also reviewed by David Zieve, MD, MHA, Medical Director, A.D.A.M., Inc.